The kelvin (symbol: K) is the SI unit of temperature. 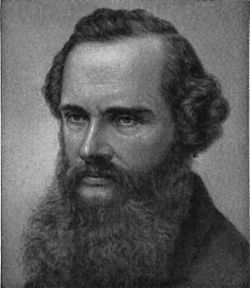 The Kelvin scale is named after the Belfast-born, Glasgow University engineer and physicist William Thomson, 1st Baron Kelvin (1824–1907), who wrote of the need for an "absolute thermometric scale". Unlike the degree Fahrenheit and degree Celsius, the kelvin is not referred to or written as a degree. The Kelvin scale is defined by a specific relationship between the pressure of a gas and the temperature. This says that "the pressure of the gas is directly proportional to the temperature in Kelvin". This means that Kelvin is an absolute temperature scale, and scientists use this scale more than any other. On 16 November 2018, a new definition was adopted, in terms of a fixed value of the Boltzmann constant. For legal metrology purposes, the new definition will officially come into force on 20 May 2019 (the 130th anniversary of the Metre Convention). It is important to notice that the name of this unit is simply kelvin (with a lowercase initial), not "degree Kelvin". In English, it undergoes normal plural inflection as kelvins. For example, the boiling point of liquid nitrogen is 77 kelvins. Kelvin Facts for Kids. Kiddle Encyclopedia.